Emory's Pulmonary and Critical Care Medicine Fellowship recruits six fellows annually for a three-to-four year period of specialty experience including both clinical and research training. Information about our straight critical care pathway can be found here. Interact with the Emory Pulmonary, Allergy, Critical Care and Sleep Medicine fellowship program on . During their Pulmonary and Critical Care clinical experience, fellows are expected to develop and refine skills essential for the practice of Pulmonary and Critical Care Medicine including history taking, physical examination, formulating diagnostic and therapeutic plans, performing bronchoscopies, intubations, pleural biopsies, performing and supervising other pulmonary procedures such as ventilator management, thoracentesis, chest tubes, central lines, pulmonary artery catheters, critical care ultrasonography, and arterial lines, and learning to interpret pulmonary function tests. Elective time for additional dedicated training in epidemiology, lung transplantation, fibrotic lung diseases, asthma, cystic fibrosis, interstitial lung disease, interventional pulmonary, and sleep disorders medicine is available based on the career goals and prior experience of the trainee. Emory University Hospital and the Emory Clinic - a 605 bed tertiary referral facility with a busy affiliated outpatient center located on the campus of Emory University. Its staff, limited to full-time faculty of the Emory School of Medicine, care for patients referred from all over the United States and throughout the world. More than 18,000 patients are admitted annually. The hospital is the largest transplant center in Georgia and one of the largest and most diversified in the Southeast, offering heart, heart-lung, kidney, liver, pancreas-kidney, cornea, bone, and bone marrow transplants. A 450,000-square-foot addition to EUH will open in 2017, and will house our new state-of-the-art medical intensive care unit. Our Division's program in Advanced Lung Disease, including the interstitial lung disease program, the cystic fibrosis program, the pulmonary hypertension program and the McKelvey Lung Transplant Center are located at this facility. Other active sub-subspecialties at this site include an asthma program and our interventional program (with affilitated interventional fellowship). Grady Memorial Hospital - With its 971 total beds, Grady is the largest general hospital in Georgia and one of the largest in the world. Nearly 30,000 inpatients and more than 600,000 outpatients are treated here each year. Home to Atlanta’s Level 1 Trauma Center, and one of only two burn centers in the state, Grady is known for its emergency and trauma care; it houses Georgia's only poison center and the recently opened Marcus Stroke and NeuroScience Center is the new home of Grady’s award-winning Joint Commission Certified Stroke Center. Atlanta VA Medical Center - Housing one of the largest VA research programs in the nation, this 405-bed hospital includes one of the national VA Rehabilitation Research Centers of Excellence and a growing Health Services Research program. The Atlanta VA Medical Center provides a full range of patient care services complete with state-of-the-art technology, education, and research. Emory University Hospital Midtown - Located in midtown Atlanta, this 583-bed community-based acute care teaching hospital was designated by the Atlanta Olympics organizing committee as a hospital for the 1996 Olympics responsible for the care of athletes. The beautiful affiliated 19-story, 350,000 square-foot medical office tower, completed in 2002, houses a busy outpatient practice. Emory Saint Joseph's Hospital - Founded by the Sisters of Mercy in 1880, Emory Saint Joseph’s Hospital is Atlanta's longest-serving hospital. Today, the 410-bed, acute-care facility is recognized as one of the top specialty-referral hospitals in the Southeast. As one of our busiest (but most well-loved) rotations, the Grady MICU experience has fellows working with four teams of students, interns and residents, and two faculty members, in managing critical-ill patients. Because there is no separate cardiac care unit at Grady, this rotation includes that care of patients with acute coronary syndromes, in addition to more traditional MICU diagnoses. Fellows in the VA MICU supervise four medical residents in the care of critically-ill patients. Time permitting, fellows on this rotation also participate in pulmonary consults and associated procedures (generally bronchoscopy and thoracentesis). While fellows on this rotation manage a traditional MICU run by residents, one of the unique aspects of this experience is the opportunity to work with a team of advanced practice providers (Physicians Assistants and Nurse Practitioners) manageing a separate team of patients. The MICU at EUH offers a unique patient population within our system; many patients admitted to this service have undergone solid-organ or bone marrow transplants, while others are admitted from our advanced lung disease service with interstitial lung disease, pulmonary hypertension or cystic fibrosis. This service offers the unique opportunity to work one-on-one with a teaching attending managing a team of advanced practice providers, but without residents. This model of care is very commonly used outside of academic medicine and provides our trainees a perspective on this increasingly prevalent model of care. During these months, fellows will work with our faculty in both general pulmonary and dedicated sub-subspecialty outpatient clinics. These clinics include those focused on asthma, allergy, interventional pulmonary, sleep, interstitial lund diseases, cystic fibrosis, pulmonary hypertension and lung transplant. Fellows also rotate through our outpatient pulmonary function laboratory during this rotation, which includes experience in performing cardiopulmonary exercise tests. This rotation give fellows experience supervising a service of inpatients with complex pulmonary diseases (cystic fibrosis, interstitial lung disease, pulmonary hypertension and lung transplant). As time allows, rotating fellows also participate in affiliated clinics managing outpatients with these disease states. This month-long rotation allows fellows to gain experience in providing inpatient consultation of patients with pulmonary disease. This is a busy procedural experience as well, as many of these patients require diagnostic bronchoscopy or thoracentesis during their evaluation. This experience is a procedurally-busy service where the fellow works one-on-one with a Division faculty member. This service also covers the "code met" experience, which leads to a robust intubation experience during the rotation. One of the busiest procedural rotations in our system, the VA outpatient rotation has fellows supervising a team of outpatient consultants (including a resident and physicians assistant) in the assessment of patient referred for urgent outpatient evaluation. Many of these patients require diagnostic bronchoscopy with endobronchial ultrasound guided biopsy as part of the work-up, and fellows are expected to facilitate the patients' movement through the system from initial content to procedure to follow-up visit. First-year fellows will spend two weeks with faculty in Emory's Department of Anesthesia, to get a better grasp of basic and advanced airway management. First-year fellows will spend two weeks with our outstanding thoracic radiologists, to gain experience in the interpretation of chest radiographs and CT scans. Fellows will have a two-week experience in sleep medicine. This will predominantly consist of outpatient clinic, but there will be some experience with interpretation of home sleep apnea tests, polysomnograms, and CPAP adherence downloads as well. 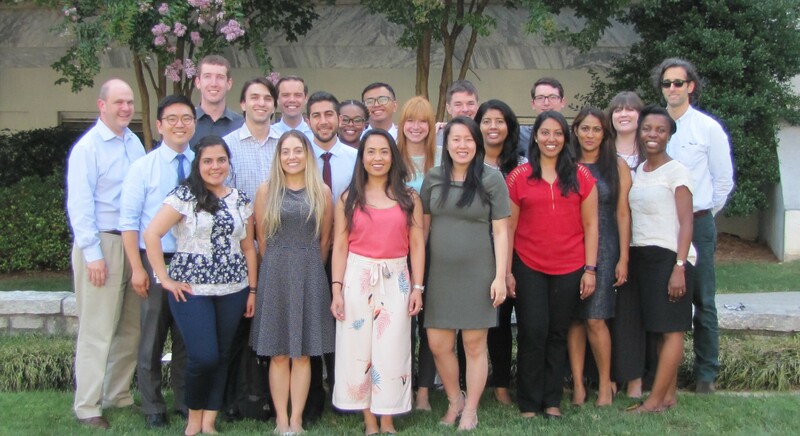 Beginning in our first year, and continuing throughout the three-year program, fellows will administer their own bi-weekly continuity clinics at Grady Memorial Hospital and the Veterans Administration Medical Center. For fellows interested in subspecializing within pulmonary medicine, additional (elective) continuity clinics in pulmonary hypertension, interstitial lung disease, cystic fibrosis, sleep medicine and transplant are available. One of the unique aspects of the Emory Pulmonary and Critical Care Medicine Fellowship Program is our individualization of the second- and third-year experience for each trainee. Half-way through the first year of training in our program, fellows participate in the Career Development Course. This course offers trainees dedicated mentoring time with many of our faculty, including those with successful research careers, the most experienced clinicians in the sub-subspecialties of pulmonary medicine, and the senior educators in the Division. These meetings allow our fellows to meet all of our potential mentors, and to get a better sense of the different pathways to success in our specialty. During follow-up meetings over the next several months, first-year fellows work with faculty leaders to develop specific, targeted career goals. We then design an individualized second- and third-year schedule to best achieve those goals. While each fellow will have a unique schedule, the general templates fall into one of two major categories, the Clinical Educator pathway or the Physician-Scientist pathway, which are further described below. Interventional pulmonology at EUH / EUHM / ESJ - During this rotation, fellows gain a greater degree of experience in basic bronchoscopy, as well as beginning to develop the skills needed for more advanced procedures, including endobronchial ultrasonography, navigational bronchoscopy, rigid bronchoscopy, tube thoracostomy, and bedside tracheostomy. Some minor experience with stenting and endobronchial laser use is also common. Trauma unit at Grady - Fellows will spend either two or four weeks rotating with the surgical trauma team at Grady's level 1 trauma center, assisting in the management of the critically ill, injured patients, with the multidisciplinary trauma team. Surgical intensive care at EUH - This twenty-bed unit admits both general and specialty surgical patients. The multidisciplinary team consists of supervising faculty from the Departments of Surgery and Emergency Medicine, as well as residents from anesthesia, surgery and emergency medicine. Nighttime intensivist in the Grady Medical ICU - Fellows will spend one month as the senior in-house physician supervising residents and interns at night as they admit and manage critically-ill patients. In addition to a number of other elective experiences, fellows enrolling on our Clinical Educator Track will identify a specific subspecialty within pulmonary or critical care medicine on which to focus; recent choices have included interstitial lung disease, pulmonary hypertension, transplantation and quality improvement in critical care. During the latter two years of training, fellows will dedicate at least eight months of time in rotations related to this specific domain, consisting of both clinical months and protected time for scholarly projects (including research abstracts, review articles and book chapters). At the conclusion of their eighteen months of clinical training, fellows will join one of our Division's NIH-funded T-32 training grants. This grant funds their research experiences, travel to relevant medical meetings, and associated coursework; some fellows on this pathway choose to pursue a full Masters degree through the Rollins School of Public Health at Emory University. Over the course of the next 24-30 months, fellows will engage in research under the supervision of one (or more) of our experienced mentors. Although it is strongly advised that fellows choose a member of our Division as their primary mentor, a fellow may choose to work with a mentor from outside the Division, particularly if that mentor has a collaborative relationship already established with one or more of our faculty. In addition to developing original research projects under the guidance of their mentor, fellows learn how to analyze data, prepare and deliver scientific presentations and write and publish original scientific manuscripts. Successful completion of this track requires fellows to present their scholarly work to both internal and external audiences. A partial list of faculty mentors within the Division can be found here. By the conclusion of the first year of training, each fellow selects a primary mentor from among our 85 faculty members; this individual, along with a secondary mentor selected by the Division's Career Development Committee (CDC), works with the fellow to maintain the trajectory necessary to achieve the goals desired by the trainee. Note that the primary mentor does not need to be the person with whom the fellow plans to do research or work clinically (though this is preferable). The most important aspects of identifying a primary mentor are the personal relationship with the mentee and a track record of success with prior fellows. In addition to regular meetings with their primary mentor, senior fellows deliver fifteen-minute semiannual "work-in-progress" presentations to the CDC, which will provide constructive feedback and ideas for potential new directions for the fellow's training and career path.